"He called a no-ball," MS Dhoni said to the leg umpire as he walked onto the field. 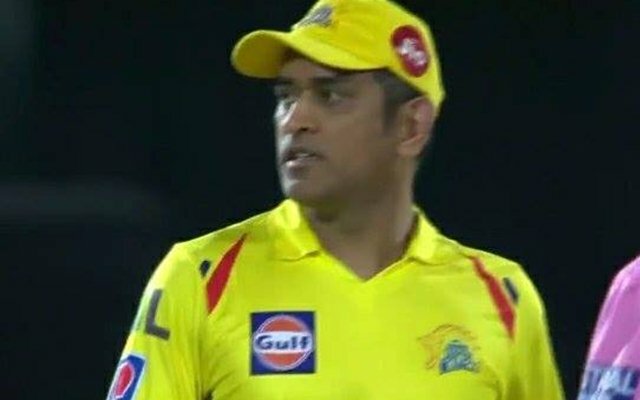 A furious MS Dhoni walking onto the field in the final over against Rajasthan Royals has gone viral now. The last over of this game has witnessed a massive controversy and has also exposed the poor umpiring standards in the IPL. But what has come out of syllabus is MS Dhoni losing his cool like he never did before. The call for a height no-ball is usually taken by the leg-umpire. Then, the same decision is conveyed to the audience and the scorers by the straight umpire. But in this game, Ulhas Gandhe, the straight umpire had a momentary ‘brain fade’ incidence. The fourth ball the Ben Stokes bowled to Mitchell Santner was clearly above the waist. However, the batsman was not standing in his crease. Ulhas Gandhe must not have observed this and was surely not the best judge to make the call. However, he immediately indicated a no-ball without consulting his partner. The no-ball buzzer went up and the crowd went berserk. Bruce Oxenford, though, decided to overrule the call which irked MS Dhoni. The wicket-keeper batsman, without a second thought, first entered the field of play. He stopped near the boundary line for a few moments and then stormed in to have an argument with the umpires. Dhoni indicated that the straight umpire called a no-ball and had an animated discussion. However, it was eventually decided that it isn’t a no-ball leaving MS Dhoni red-faced. He walked back into the dugout and the whole incident stirred up a massive controversy. MS Dhoni was even fined 50 per cent of his match fees for breaching the IPL’s code of conduct. His team, however, won the match as Mitchell Santner sent the ball into the orbits off the final ball of the match to finish the game for his team. For his top-notch knock, MSD was awarded the ‘Man of the Match’ is this game.